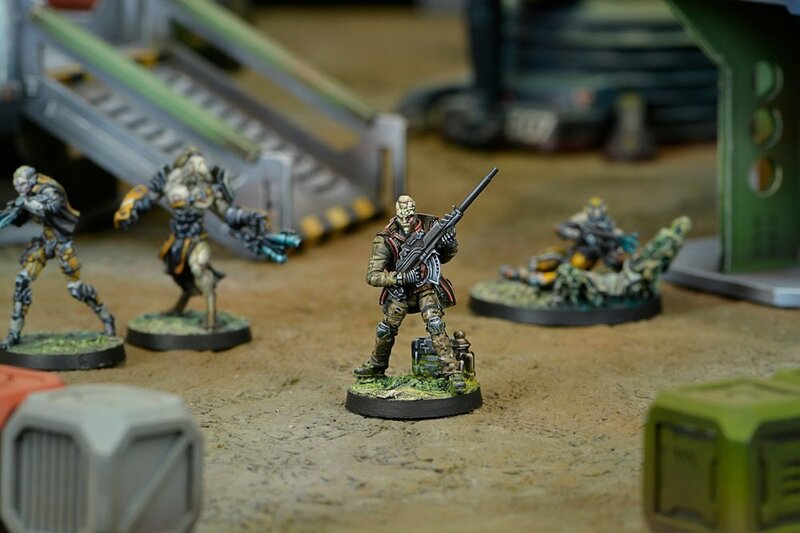 A lethal contract killer, Armand Le Muet brings a diverse and unique package of equipment to many armies in Infinity, human or otherwise. Le Muet is available to every vanilla faction (even Combined), as well as Druze Bayram Security and Ikari Company, so he can spring up just about anywhere. As you can see, Le Muet brings along a gold mine of special rules, most of which are hard to come by otherwise. Armand is a very competent shot, with BS13, and can be incredibly troublesome to shoot back against due to the ODD he carries. Symbiont Armour provides him with a second wound, and he can deploy an extra 4" onto the table, which helps him find the perfect snipers nest. All of these options do come with a price though, either profile costing more than many HI units. Minelayer or MSV1. His equipment is almost entirely the same between the two profiles, the only option being either Minelayer, or MSV1. MSV1 is a helpful tool, and helps even the ground against pesky units like Bagh-Mari or Intruders, but it does make him susceptible to White Noise. If you're using him in an army with access to White Noise, it would be a bad idea to take hi with that MSV1. For a few points less, you can instead start with an extra camo marker on the table, which can be outside your deployment zone thanks to Forward Deployment. If you're using him to defend an objective, not spending orders to move around and place that mine can be quite handy. On the surface, it's easy to pigeon hole Le Muet as an ARO piece, he has ODD and a MULTI Sniper Rifle, and that's an ideal combination for sitting back and letting your enemy waste orders on him. On the other-hand though, that MSR is still B2 in the active turn, and with ODD, he is capable of putting the enemy at -12 without much effort. This means he can effectively handle enemy link teams AROs, as well as Total Reaction bots and other hard to deal with ARO threats. For Druze Bayram I've found him to be an effective Data Tracker when killing the enemy HVT is required, as well as when keeping your DataTracker alive is a goal. He's easy to hide, and well defended with ODD and two wounds, but can also cover his own advance with the MSR while he moves in to kill the enemy HVT. If you're playing Tohaa, remember that he has Symbiont Armor, so you can stick a bomb and/or mate on him to make him extra obnoxious. Overall, he is an expensive model, no doubt, but at the same time, his range of equipment can go a long ways if you can leverage all of it. Don't be afraid to take on powerful ARO troops, and if the enemy is lacking in the MSV2 department, he can be a brutal ARO piece himself.